As an organisation we have achieved many milestones and celebrated considerable success in our relatively short post settlement history including reaching a net worth of over $1b as at 30 June 2014. While this is hugely significant and affords a certain sense of calm and stability it is not time to sit back, instead we need to ignite our desire for greater cultural capability and whānau strength. The theme for this year’s report, ‘Innovation’ encapsulates two important tribal values: rangatiratanga (leadership) and tohungatanga (expertise). These are the values we need to engage to empower our whānau, hapū and iwi to innovate. By innovation we mean daring to dream, to think big: pihi kau ake te whakaaro pai, hauhake tonu iho – when a good thought springs up, make sure it is harvested. In particular, we need to focus our energies on our tamariki and rangatahi as they are at the heart of our future. How do we ascertain what is going on for them? How do we awhi tautoko? How do we encourage diversity and ‘make their star shine’? With this in mind we have defined our activities by four key Pou: Oranga (Wellbeing), Mātauranga (Knowledge), Ngāi Tahutanga (Culture and Identity) and Te Ao Tūroa (Environment). This enables more accurate determination of success measures. Further, a wellbeing survey will be conducted to determine what initiatives have made a positive difference in the lives of whānau. Our Tribal Economies Policy is designed to support Papatipu Rūnanga to strengthen and grow. The concept of tribal economies comes from a belief that every person and community has a right to a pathway of self-actualisation via health, education and economic wellbeing. Te Pūtahitanga o Te Waipounamu, the Whānau Ora Commissioning Agency for Te Waipounamu is an exciting new development. Firstly it is a strong show of kotahitanga, shared values and commitment among the nine Te Waipounamu iwi and secondly it provides an opportunity to affect meaningful change for whānau. Work continues on the affordable housing partnership model for whānau. This project is a collaboration between Te Rūnanga o Ngāi Tahu, Ngāi Tahu Property (NTP) and He Oranga Pounamu and aims to support whānau to move on to the home ownership ladder without taking risks. A highlight has been strengthening our relationship with NTP who have lent their professional expertise to the project. We are pleased to report that the three-house affordable rental pilot in Addington is on track for completion in October. Our external relationships continue to strengthen and bear fruit. In recent times we have been enjoying positive relationships with the Crown while our ongoing presence at the Iwi Chairs’ Forum connects us with Māoridom and provides a forum to air our perspective on Māori issues. Our relationship with the Department of Conservation remains a focus to ensure appropriate support for Papatipu Rūnanga. It’s a very busy time ahead. In November, Hui-ā-Tau will be held on Te Tai Poutini and in March 2015 we will play host to Te Matatini here in Ōtautahi. This event is huge for Ngāi Tahu with over 30,000 performers and supporters expected to descend on Te Waipounamu for what is the biggest event in the cultural calendar for Aotearoa. The results of the Wellbeing Survey will provide an indicator of our success in delivering meaningful outcomes to whānau. We look forward to the challenges that lie ahead in sparking the sense of possibility that lies within us all. Mō tātou, ā, mō kā uri amuri ake nei. 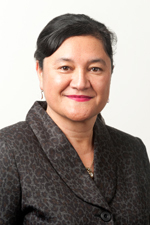 $320,000 Te Pūtea Whakamahi grants paid to each Papatipu Rūnanga (FY13 $280,000). In total $5,760,000. We continue to transition to an outcomes-based framework with activities of the Office defined by four key Pou: Oranga (Wellbeing), Mātauranga (Knowledge), Ngāi Tahutanga (Culture and Identity) and Te Ao Tūroa (Environment). This enables more accurate determination of success measures in delivering to whānau, hapū and iwi. and Te Ao Pūtea (investment planning). These are the activities that work to grow and strengthen the structure that enables us to deliver the outcomes. This year we distributed $320,000 to each of the Papatipu Rūnanga via the Te Pūtea Whakamahi grants an increase of $40,000 on the previous year and this figure is set to increase again in FY15. Ensuring our whānau are healthy and living in healthy environments is always a priority. In April, Te Pūtahitanga o Te Waipounamu, the South Island Whānau Ora commissioning agency, was established to fund and support innovative ideas that encourage whanau rangatiratanga and wellbeing. Te Pūtahitanga is an exciting proposition in that it brings together the nine iwi of Te Waipounamu in a show of kotahitanga, shared values and commitment. More importantly though, the agency has the mandate to effect real change that will act to uplift whānau to carve out their futures. We look forward to celebrating the successful outcomes achieved by this new approach to whānau wellbeing. We continue to provide our internal mechanisms for supporting whānau wellbeing with grants such as kaumātua grants ($955,612) and Pūtea Manaaki ($26,000). We believe however, that we can gain more by helping our Papatipu Rūnanga to establish and grow their own businesses. There are some exciting ideas out there among our rūnanga and we are providing expertise, research assistance and resource to support these projects in their set up phase. He Oranga Pounamu (HOP) and its provider network are the connectors for whānau to health and social services in Te Waipounamu. The Kaitoko Whānau Programme is an important kaupapa for HOP working with whānau to re-build and recover following the Canterbury earthquakes. HOP’s team of five Kaitoko (community workers) have been actively engaged with whānau over the year to support successful EQC (Earthquake Commission) outcomes. So far 141 whānau have had their EQC issues resolved and a further 89 are still engaged with Kaitoko to reach closure. Other highlights of the programme include: participation of whānau in wānanga and budgeting advice; Specialist Advice grants were approved for 35 whānau and Te Pūtea Manaaki grants for 42 whānau. HOP leads the largest Whānau Ora Collective, consisting of 19 Māori Providers, in New Zealand. During the past 12 month period Providers engaged with 13,096 individual whānau members across a range of services. HOP is co-ordinating the development of the affordable housing model in collaboration with the Office and Ngāi Tahu Property. A three-home affordable rental pilot in Addington is at the first stage and is due for completion in October. 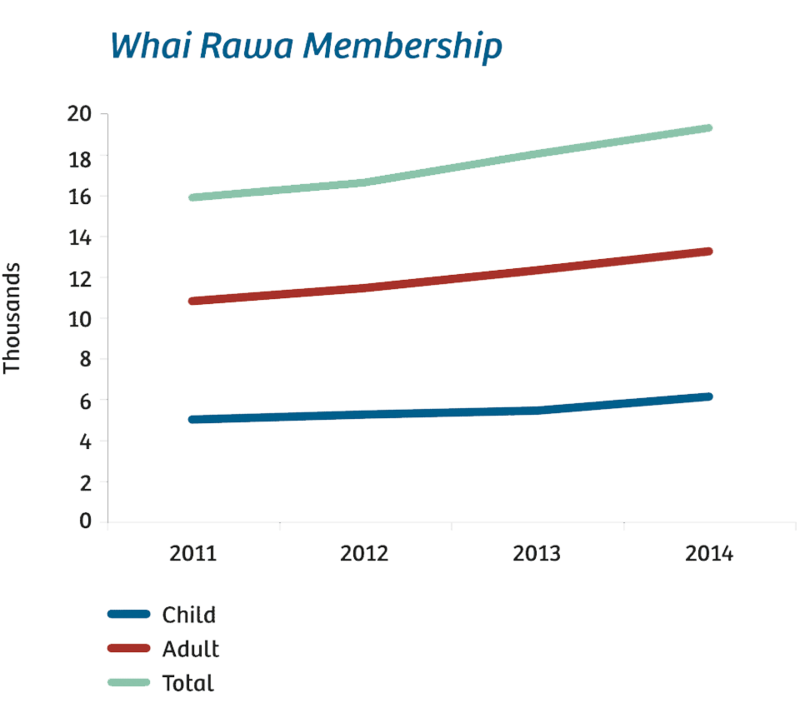 Whai Rawa continues to grow with 1339 new Whai Rawa enrolments for the year. Since its inception Te Rūnanga has contributed annually to most members (by way of matched savings and distribution payments and associated tax credits). In the year to March 31, Whai Rawa distributed $2.5m to members as well as paying administration costs, worth around $1.5m. As at 30 June 2014 the Whai Rawa balance was $35,857,004. Total amount deposited by members and whānau since inception $17,245,538. Withdrawals by members since inception $3,089,912. The annualised return for the four years ending 30 June 2014 was 6.24%. 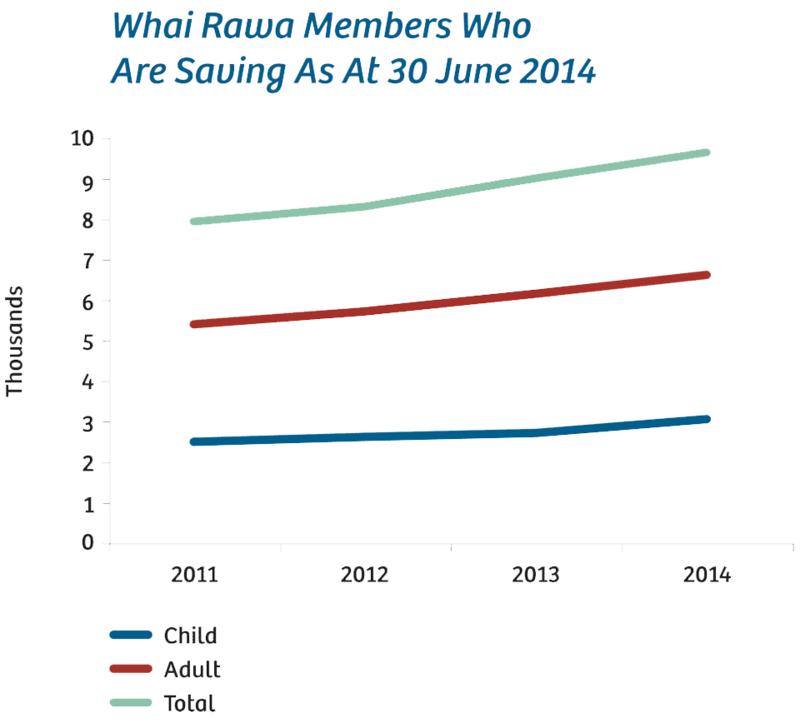 The annualised return paid to members (before PIE tax) for 12 months to 31 March 2014 was 7.16%. We remain focused on building the capacity and wellbeing of our marae communities. We have allocated $1,007,125 via the Marae Development Fund including: $600,000 to Te Rūnanga o Ngāti Waewae for the building of their new marae complex due for completion in November and $300,000 to Ōnuku for their new wharekai currently under construction. The Ngāi Tahu Fund delivered funds of $474,899 to 57 projects including taiaha wānanga, and support for the visit of the double-hulled voyaging waka Haunui. Funding rounds were also set up to support Ngāi Tahu whānau engagement and participation in Te Matatini. An exciting development for the Whakapapa team is the development of a web portal that will eventually allow registered whānau to research their own whakapapa. As at year-end there were 52,549 whānau registered with Ngāi Tahu Whakapapa. Kotahi Mano Kāika continues to fund and host te reo initiatives that encourage the growth and intergenerational transmission of te reo among our whānau. A highlight of the year was aligning the website with the main Ngāi Tahu site with a successful social media promotions campaign receiving national media coverage. The development of the Ngāi Tahu Archives is making good progress. The team is also working on a project with Ngāi Tahu Communications to formally archive our substantial film and video collection. The Ngāi Tahu Archives team is also making digital copies of the audio cassettes from the Ngāi Tahu Waitangi Tribunal hearings. Ensuring the health and ongoing availability of our mahinga kai species is always a priority with $148,550 being distributed through the Mahinga Kai Enhancement Fund to support this kaupapa. Tītī Islands Administering Body, Tītī committee, Kaupapa Kererū, Te Kōhaka o Tūhaitara and Te Roto o Takuahi Research and Development LTD – Te Roto o Wairewa were among the fund recipients. In the past year we also distributed a total of $230,000 to a range of Ngāi Tahu Regional Environmental entities to support them with their mahi. Seven new Mataitai and two Taiāpure were established during the year. Five of these were as a result of the successful implementation of Te Korowai in Kaikōura. Work is currently underway on a much needed revamp of the State of the Takiwā Cultural Monitoring Framework. This is due for completion within the next two years. Our Mana Whenua Working Party are the kaitiaki guiding our farming initiatives and in particular the dairy farms being developed at Balmoral and Eyrewell. Their role is vital in ensuring the wellbeing of our whenua in our land-based operations. A priority for our environment team is working with the Department of Conservation to strengthen our relationship to ensure their support for our Papatipu Rūnanga. We acknowledge the importance of access to knowledge and education for our whānau. No matter where we are on the learning journey, we all need opportunity for advancement. Whenua Kura is a partnership between Ngāi Tahu Property, Te Tapuae o Rehua and Lincoln University, which is designed to grow the number of Māori leaders in the farming sector. Recently, we filled the inaugural course with 13 students. The demand is definitely out there and this is a wonderful opportunity to provide careers in this sector. Our support continues for pre-trade training, apprenticeships, and leadership opportunities in the building industry. Our pre-trade training programme, He Toki ki te Rika, continues to go from strength to strength with over 700 Māori having enrolled since the programme began. Indeed, it was a successful year for Te Tapuae o Rehua with $7.4m worth of funding accessed to fund a variety of programmes, including our involvement in trade training and the delivery of Professional Learning Development for teachers. Manawa Hou, a youth initiative designed to give rangatahi an opportunity to explore their Ngāi Tahu identity, is ongoing with courses held a couple of times a year. During the year 770 Ngāi Tahu Ka Pūtea tertiary grants and scholarships were funded for the year amounting to $443,000. Continued demand for out of school tuition grants saw 470 grants provided to a value of $237,000. Strong performance across the Group has led to another record performance for Ngāi Tahu Holdings ending the year with a net operating surplus of $82.98m and a net profit of $160.58m. When taken with gains in the value of Ryman and other investments, total returns were $212.87m. This outstanding result reflects a combination of factors that has resulted in strong performance across the Group. In particular exceptionally strong residential property sales at Wigram Skies and Prestons, increasing returns from our dairy operations and conversions, a record Seafood result, improved earnings in Tourism and strong growth in our other investments including Ryman. Shareholder equity increased $250m for the year to $987.79m (FY13 $738.22m) and Te Rūnanga Group equity (which includes seafood quota managed by NTH) now exceeds $1 billion. Ngāi Tahu Property had an exceptional year and this trend is set to continue with new opportunities arising in the sector. Ngāi Tahu Seafood (NTS) managed its fifth successive record result with a successful mussel farm expansion and continued demand for kōura in China. Our farming operation at Eyrewell is exceeding expectations with three farms operational in FY14 and above average milk production. Things are looking up for Ngāi Tahu Tourism (NTT) with positive growth at its Dart River and Agrodome operations and forecast growth of 3.5%p.a. for the sector over the next 3 – 4 years. Ngāi Tahu Capital continues to benefit from Ryman Healthcare’s strong performance with a year-end return of $75.60m. Our strong balance sheet allows us to explore new investment opportunities. In March we purchased Waikato Milking Systems (WMS) in partnership with Tainui Group Holdings and Pioneer Capital. The Hamilton based company has a reputation for developing innovative dairying technology and exports to 30 countries globally. We also acquired Go Bus after year-end in partnership with Tainui. Go Bus is one of New Zealand’s leading bus operators and is seen as a great opportunity for the group. During the year we farewelled two key team members: John Thorburn, CE, NTT and Brian Moriarty, CE, NTS. We take this opportunity to acknowledge the outstanding contributions of both John and Brian in their time with us and wish them both all the very best in their future endeavours. Recently we completed a review of the NTH brand and undertook a project to ensure alignment across the Group. This proved valuable taking time to reflect on our past and our evolution as an organisation and importantly acknowledging the commercial acumen that has been pulsing through the veins of the iwi for hundreds of years. Our vision is based on our commitment to past, present and future generations. It is strongly values based – and resolute. Simply put, despite our size, span and aspirations, we are essentially a family business. It is important that our brand reflects this and affirms us as being distinctly Ngāi Tahu in the marketplace. We continue to focus on improving our governance across our commercial operations and we have robust structures and processes in place in all our subsidiary companies. The contribution of professional governance and sector expertise has been instrumental in our success over recent years. As we move forward we remain focused on looking for innovative opportunities for re-investment and in developing strategic partnerships with like-minded investors who share our vision and values. *The above numbers have been extracted from the Ngāi Tahu Holdings Corporation Financial Statements for the year ended 30 June 2014. Ngāi Tahu Holdings primarily invests in businesses we deem to be a good fit with our values. Ryman Healthcare fulfilled that for us 16 years ago when we first invested and continues to do so today. The ongoing strength of this investment continues to deliver great results with a significant increase in share price for the year. During the year we sold down $15m of our Ryman share portfolio. We retain a 5.5% shareholding with a value of $235m and continue to enjoy the ongoing success of our long-term approach to investment. Always on the lookout for opportunities that align with our Investment Policy Framework and values, we purchased a third share in Waikato Milking Systems in partnership with Tainui Group Holdings and Pioneer Capital. We are excited to be a shareholder in this dynamic, innovative dairying technology company and believe the investment aligns well with the ongoing growth in our agricultural operations. At year-end the total NTC investment portfolio was worth $291.92m (FY13: $207.35m). We remain committed to exploring the potential for growing and diversifying our portfolio on behalf of our shareholders, Ngāi Tahu Whānui. As the Group grows through reinvesting our profits, we continue to look for investments that are a good fit for our portfolio. We aim to progress further new investments through Ngāi Tahu Capital in the year to come. Ngāi Tahu Property (NTP) has once again confirmed its place as a leading property development and investment company demonstrating a strong performance across its portfolio with a year end Operating EBIT of $63.35m (FY13 $38.2m) and its third consecutive record result. The post earthquake housing shortage in Christchurch has meant ongoing high demand for sections within our residential developments: Wigram Skies in south west Christchurch, Prestons in north east Christchurch and Te Whāriki in Lincoln. Sales in all locations were well ahead of target with over 520 sections being sold for the year. In particular, sections in Wigram Skies are selling well with the development proving to be one of Christchurch’s premier locations. Construction has begun at The Landing, the $40 million town centre at the heart of Wigram Skies. Stage one will feature an architecturally designed town square encompassing an array of ‘high street’ style retail and cafés as well as a New World supermarket and childcare centre. The New Zealand Blood Service (NZBS) building is ahead of schedule and under budget. The outstanding relationship we enjoy with the staff at NZBS has been a highlight of this project and has resulted in us agreeing and signing a 30-year lease on the building. NTP continues to grow its comprehensive portfolio of high quality commercial properties spread throughout Te Waipounamu. The strength of this portfolio is the backbone of the company providing a solid year on year result with FY14 being no exception. The successful conclusion to the Earthquake Insurance Claim on the ex-Christchurch Police Station was a positive outcome and will enable NTP to look to the future and progress with the redevelopment of the site. It was a great year for Ngāi Tahu Farming with the Eyrewell development progressing successfully. The original three farms are now all operational and returning above budget results. Four more irrigated farms have been brought into production and another four are in development. Development of the land at Balmoral is progressing and the team is working through regulatory processes to ensure the Ngāi Tahu Farming programme remains on track financially and environmentally. We are fortunate to have some fantastic people working on our farms and we are excited by the future opportunities that these developments offer in terms of creating employment for the iwi. Currently the farms employ 28 permament staff including six Ngāi Tahu. These figures are predicted to increase as students take up opportunities for training via the Whenua Kura programme, which is an iwi-led agricultural training programme between Lincoln University, Ngāi Tahu Farming, Te Tapuae o Rehua and Te Rūnanga o Ngāi Tahu. Receiving recognition at two recent award ceremonies was a highlight of the year for Ngāi Tahu Farming. Dairy Manager Phil Colombus came third in the NZ Dairy Industry’s National Farm Manager of the Year awards and our first farm at Eyrewell received recognition for its farming practice and innovative use of technology winning the Environment Canterbury Water Quality Award at the regional Ballance Farm Environment Awards. It has been a year of partnerships for NTP as Christchurch gears up for the central city rebuild. We have been working closely with the Carter Group on a number of projects including the Plenary Conventions NZ consortium, which also includes international public infrastructure specialist, Plenary Group. Plenary Conventions NZ is the New Zealand Government preferred development consortium and investor for the new Christchurch Convention Centre Precinct. Forming enduring relationships with like-minded partners who share our vision and values is at the cornerstone of every decision we make. We continue to enjoy the positive relationship we have with the Crown, the Christchurch City Council and the many joint-venture partners we do business with. Working closely with the iwi to ensure that in everything we do we are upholding the vision and values of our shareholders is fundamental to our success. The Manawhenua Working Party is our cultural sounding board for the farms and enables us to learn and work through the often complex and difficult processes we need to navigate to reach mutually beneficial outcomes. The addition of a stakeholder relationship manager to the team has been invaluable in improving our ongoing relationships with the Papatipu Rūnanga and in growing the cultural understanding of our team. We remain focused on growing the business. While we continue to maximise potential opportunities locally, looking ahead we plan to grow our geographical spread and are currently exploring opportunities beyond Te Waipounamu. The year in review was much improved for Ngāi Tahu Tourism (NTT) with an operating surplus of $6.1m (FY13 $3.5m). This was largely due to the resurgence in traditional markets coupled with continued growth in the Asian market resulting in a strong Dart River result. The Chinese Travel Law, which came into effect on 1 October 2013 to, prevent unfair competition and ensure tourist safety is proving to have a positive impact in the New Zealand market. While it has reduced the volume of travelers, those who are arriving are choosing New Zealand as their sole destination and therefore staying longer and spending more. Playing host to the young royals was a highlight of the year for Shotover Jet. The resulting publicity certainly helped to increase our visitor numbers following William and Kate’s visit. While slightly below budget, it was a much improved year-end result for Shotover. The gifting of a pounamu touchstone by the southern kaitiaki rūnanga was another special moment, enhancing the bond we have with the iwi. It was a great year for Dart River with visitor numbers increasing by almost 70% on the previous year. We have worked hard to stabilise our operations at Franz Josef and while walking access is no longer an option, the new ice explorer experience via helicopter is proving popular and we are back to turning a profit. We are currently working with the Makaawhio Rūnanga and the Department of Conservation (DOC) on a new Glacier Base building that will also house the DOC visitor centre and area office. In the North Island, Agrodome continued to experience the benefits of the buoyant Chinese market. This iconic tourism venture is hugely popular with the Asian markets. On 1 July we concluded the purchase of the remaining shares in Agrodome. The owners explicitly wanted to sell to Ngāi Tahu because we are a whānau business with a focus on intergenerational investment. The management team is focused on product and positioning at the Rainbow Springs operation after a challenging year. A new ticketing and reservation system was successfully implemented earlier in the year. This is an exciting new development connecting up all of our businesses and allowing us more flexibility in the market. John Thorburn. Quinton joins us after eight years at Tourism Holdings Ltd as Chief Operating Officer – Tourism and Group Support Services. 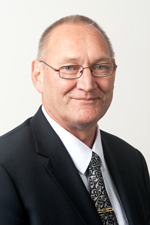 We would like to take this opportunity to acknowledge John for his hard work and dedication to Ngāi Tahu Tourism during a difficult few years for the tourism industry. While there remains some uncertainty in the global economy, the forecast for the tourism industry remains positive with growth of 3.5% expected for the next four years. Our focus therefore, will be on ensuring, that across the group, we are well positioned to maximise gains to be made from a more positive market while continuing to deliver outstanding customer experiences. The ongoing demand for Ngāi Tahu Seafood’s (NTS) product both locally and globally continues to produce strong results. The company has achieved its fifth consecutive record result with earnings before interest and tax of $19.3m. Demand for live kōura in China fluctuated throughout the year with the Chinese calendar of festivals but remains generally strong as the Chinese economy continues to grow, albeit at a slower rate. Kōura is valued highly in China and robust market demand helps to counter the impact of the strong NZ dollar on earnings. Over the last three years NTS has also invested in South Australian fishing quota, and is active in exporting live lobsters to China from Australia. Sales of this species were affected by a national cutback on spending for Chinese government officials. Many international products formerly in high demand at restaurant banquets have been similarly affected, including abalone from around the world. Fortunately NTS product is well established in other South East Asian markets, but overall price competition has increased. It was a standout year for NTS Greenshell mussels as international prices rose in response to limited production from NZ mussel farms last season. Our own recently acquired mussel farms came on-stream and started producing at this opportune time; so, although only a small player, NTS was well positioned to meet a portion of the unsatisfied demand. The outlook for the new season remains encouraging. The ‘bluffies’ enjoyed another great season. The weather was kind to the catching fleet meaning oysters were reliably available throughout the season, especially in the early months –good news for all those who look forward to the start of the Bluff oyster season each March. NTS values its ongoing relationships with our fishers and suppliers and the commitment of our staff. The Murihiku Fisher Development Pool was set up in 2008 to create opportunities for a new generation of Ngāi Tahu fishers and to ensure the long-term future of the Murihiku fishery, with Fisheries Settlement lobster and blue cod quota set aside for this purpose. Since then, some fishers have successfully moved on to establish their own commercial businesses and are now suppliers to NTS. A review is under way to ensure the programme is structured to support all member fishers in a manner that is commercially sustainable for NTS. Already Ngāi Tahu fishing quota supports fishing whānau around Te Waipounamu. Approximately 50 Ngāi Tahu fishing businesses contract for Annual Catch Entitlement (ACE) across the range of species, including a wide variety of finfish. ACE is also going to boats with Ngāi Tahu crew on board. In April, we farewelled Chief Executive Brian Moriarty. We would like to take this opportunity to acknowledge the valuable contribution Brian made over his time with NTS and wish him all the best in his retirement. At the end of the financial year Ross Keenan, a long serving director of the company, also retired. We acknowledge Ross’s substantial contribution to the company over an extended period. We appreciate the commitment of the developing Ngāi Tahu commercial directors in the Manawa Nui Programme. The programme provides valuable experience, with NTS welcoming Nadine Tunley to the board to replace Reon Edwards who moved on to Ngāi Tahu Tourism. During the year NTS made a foray into E-Commerce as part of a New Zealand Trade and Enterprise (NZTE) initiative to promote New Zealand live seafood product on the huge Chinese B2C website, TMALL. Our Bluff oysters were featured as part of the weeklong promotion seen by online consumers across China. With E-Commerce potentially a significant channel for the future it was a valuable exercise for us to be involved in. While challenges remain, our international reputation as a supplier of premium quality seafood and the diversity of our product remain key to our success. We stay focused on strengthening our position in the international marketplace and leveraging new business opportunities through existing and potential relationships.